Day ten was a day of luxury. Waking up at the gorgeous Hacienda Uayamon, we had breakfast and then relaxed by the pool, which was surrounded by the ruins of one of the buildings on the property. In the height of its prosperity, the Yucatan Peninsula made a fortune in the creation and sales of a certain type of rope. 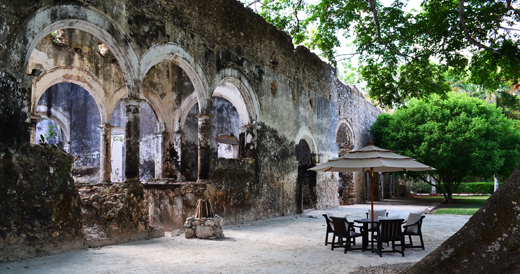 When synthetic replacements came along, the area fell into ruin, leaving many of the haciendas (basically plantations) abandoned. Today, Starwood has restored several of these haciendas into the most fabulous, private, and luxurious hotels you could imagine. 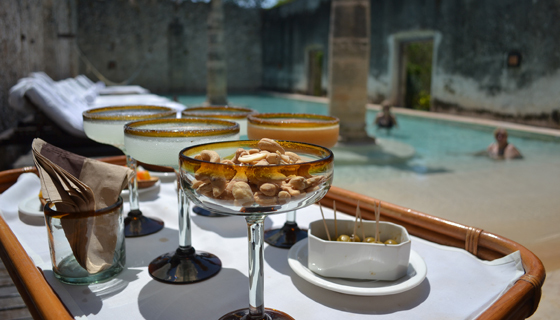 After leaving Uayamon, we were fortunate enough to stay in another hacienda property, Hacienda Santa Rosa, the following night! After breakfast at Santa Rosa, we set out for an expertly guided exploration of the archeological site Uxmal, which many consider to be one of the finest examples of classic Mayan architecture. We were lucky to have a perfectly sunny afternoon at Uxmal, allowing us to get some surreal photos from the site. 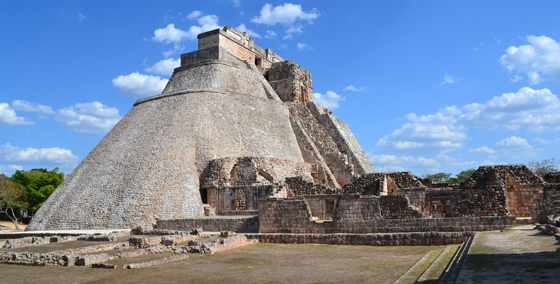 From Uxmal, we traveled to Merida, the capital city of the Yucatan. Upon arrival, we visited the Governor’s Palace, where our Journey Mexico guide Alex explained the significance of the giant and moving murals that line its halls. 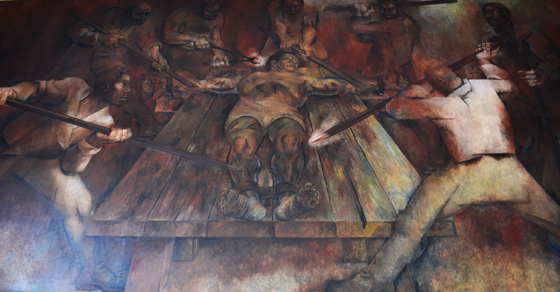 Each mural plays a part in the history of Mexico, and several of the depictions of what the Spanish did to the natives were tough to view. From the palace, we visited Merida’s most extravagant street, which is lined with massive mansions built in the style of the French. 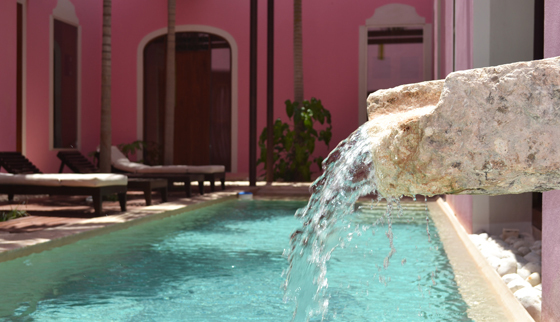 On this street, we visited the super-chic boutique hotel Rosas y Xocolate. If you have a girlfriend or wife who likes pink and chocolate, trust me, she would die to stay here. 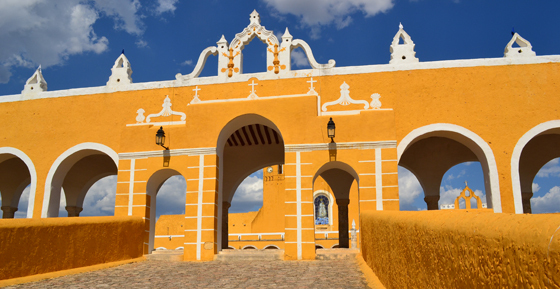 Moving on from Merida, we journeyed to the magical town of Izamal, the “Yellow City,” where we visited the convent where the Spanish Bishop Diego de Landa Calderon burned many of the Mayan codices and images, effectively erasing much of Mayan history. From Izamal, we traveled to our final destination of the day, the Lodge at Chichen Itza, which is a hotel literally a stone’s throw away from the archeological site. It was originally built to house the first archeologists from Harvard University to excavate the site. Stay tuned for a report on what we saw tomorrow!